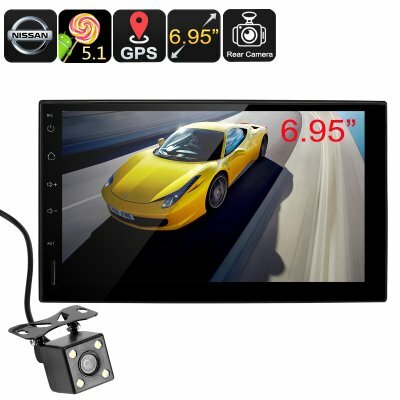 Successfully Added 2 DIN Nissan Android Media Player - Android OS, Bluetooth Hands Free, GPS Navigation, Rearview Backup Camera to your Shopping Cart. Suitable for a full range of Nissan cars, this 2 Din media player equips your car with Android for a smarter driving experience. With an Android 5.1 media player, you will be able to enjoy a wide range of entertainment in your car. Music, movies apps, and games offer an intelligent ride. The steering wheel learning functions let you program the buttons on your Nissan's steering wheel. This will let you change stations, pause music, skip tracks and much more without having to take your hands off the wheel. This 2Din Nissan car media player is equipped with Bluetooth. This lets you sync your iOS or Android smartphone to the car stereo to receives calls through it effortlessly. There is phone book support so you can quickly search contacts and even see caller ID when a call is incoming. A rearview backup camera that comes with this car media system is easy to install and brings an easy to view live feed to make reversing and parking a doddle. All major radio regions are supported across the FM frequencies so you'll have access to your local radio channels. You can connect 4x 45Watt speakers through this car stereo giving you 180Watts of brilliant sound. If you'd rather listen to your own music collection then a USB port lets you connect an extensive media and audio library as it supports memory pens as well as HDD up to 500GB. Which equates to around 100,000 tracks of music or over 250 days of music. When it comes to navigation you can rely on this media players GPS prowess. Using Android maps you'll be directed to your destinations by a clear onscreen map with directional prompts and alerted to each turn with the voice prompts. So throw out the old paper maps and switch the digital age of navigation. All these features bring you and your passengers a more pleasurable driving experience. Now being stuck in traffic or ensuring the school run will be stress-free and enjoyable. The incredibly low price of this 2 DIN media player will also save you money making it an affordable upgrade for your car. This 2 Din Media Player comes with a 12 months warranty, brought to you by the leader in electronic devices as well as wholesale car stereos and accessories..